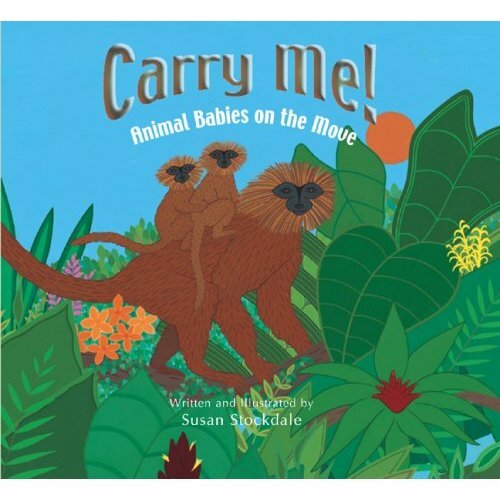 Over summer we read a number of non-fiction animal picture books. Some were quite bland and boring, some had stunning visuals but pretty staid text, and some were quite a delight as they offered interactive reading along with clever visuals. Collected here is a small subset of wonderful non-fiction animal picture books, presented in no particular order, that bridge the gap between a fictional animal storybook and fully fact-oriented text book - a nice balance that focuses on providing information without overwhelming the young minds... with stunning pictures to boot. It is not a coincidence that many a book listed here are by the same author. Being a specialized yet accessible topic, it stands to reason that quite a few authors have consistently managed to present engaging, entertaining, and informative books. Along the way, I've grown to love and respect Steve Jenkins and Robin Page thanks to their breath-taking books. Quite a number of the books collected here are part of a series that explore similar themes and are all equally appealing, even if the all the titles in the series are not listed below. This is by no means an exhaustive list, and I am sure we will be reading more wonderful books along the way and collecting them here. The book is beautifully illustrated using cut-paper artwork, with amazing likeness to the animals represented. Each double-page spread shows zoomed-in view of a particular body part of a set of animals, say nose, asking What do you do with a nose like this? This works at two levels - first, to identify which animal each nose belongs to; second, to learn how these noses are used by these animals. The following double-page spread shows the animals in full form so we can identify who the nose belongs to, with a brief sentence highlighting what each animal does with its nose. If you are a platypus, you use your nose to dig in the mud shows an accompanying picture of a sticking its nose in the mud. The physical arrangement of the pictures are the similar in both spreads making it consistent and easy to follow. For older readers, there is additional information on each animal at the back of the book. 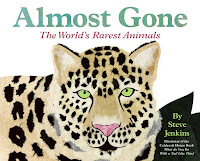 Fascinating facts about amazing animals, presented with wonderful visuals through rich cut-paper illustrations in a child-friendly way seems to be the hallmark of author/illustrator Steve Jenkins' books, some of which are mentioned below. Six different animal habitats are presented here, with eight animals from each habitat. On this page, we see various animals well-hidden in and around a pond with just a small part of them showing through. On first read, it is quite a challenge to guess these hidden animals unless one has studied various biomes around the world. The following page removes the visual display of the habitat, revealing just the animals in their full form, accompanied by a short description about them. At the back of the book there are thumbnails of the animals with some facts presented in a child-friendly way. The cut-paper art work is stunning and inspiring. We've lined up quite a few cut-paper collage projects to emulate the spectacular visuals in this book. 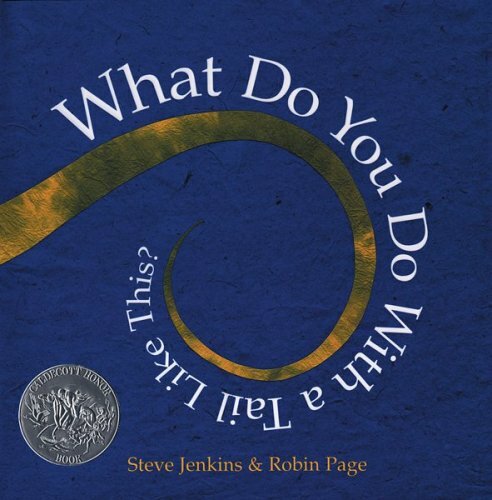 After reading this book, I was thrilled to hear Oyster catcher, Natterjack toad, Cassowary, Muskrat, Kangaroo rat, Secretary Bird, Serval and many more animals feature in our "I'm thinking of an animal..." game we play - sort of like 20-questions allowing descriptive answers to Where does it live? What does it eat? How does it move? What color is it? and so on. We learn about many of the animals on the verge of extinction, and a few that are gone forever, along with some rare species that have made a comeback thanks to diligent efforts. 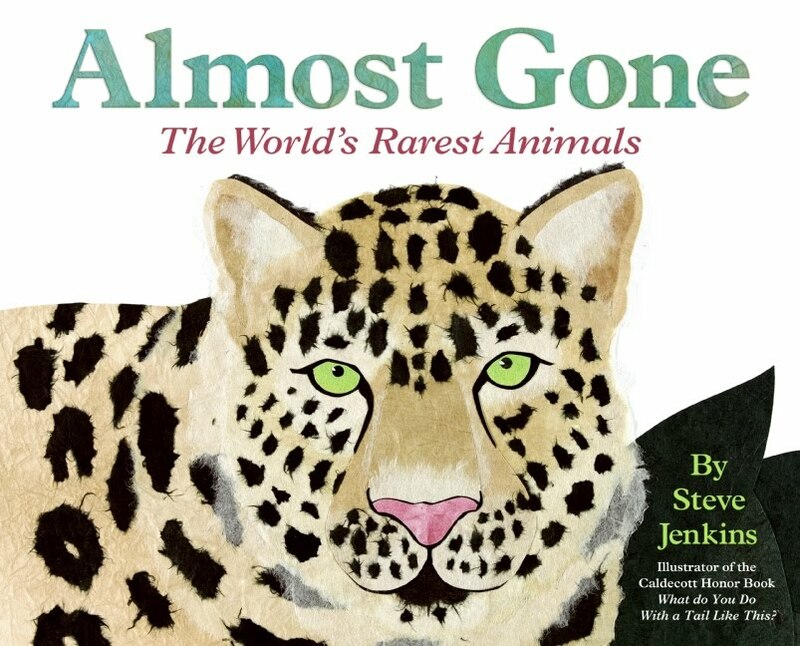 The book starts off by explaining in a child-friendly way what makes an animal species endangered. The cut-paper artwork on a stark white background makes each endangered animal stand out majestic and beautiful. The accompanying text shares some facts about its range, behavior, diet, and some of the conditions that threaten its welfare. The actual number of animals remaining (at the time the book was written) is noted, tugging at our heartstrings. As with the other Steve Jenkins' books above, the visuals are strikingly realistic and truly awesome. 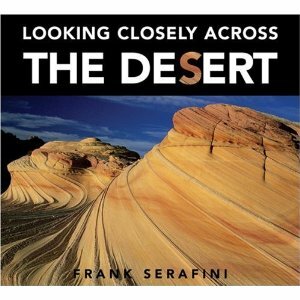 Through a tight close-up on a stark black background, Frank Serafini, zooms in on a small part of an object, inviting us to guess what it is: Look closely what do you see? Turn the page, and we see the answer in its full form: A Prickly Pear Cactus. A couple of short paragraphs gives more information about it, including the fact that people use these juicy plump fruits to make jams and jellies! From Spiny Lizard to Big Horn Sheep to Diamondback Rattlesnake, from Sandstone wave to Saguaro cactus flower to Agave, we learn about things that live in desert ecosystems. The book compels us to take a closer look at flora /fauna and even landscape that are an integral part of the Earth and learn to appreciate their uniqueness. Also in this series, Looking Closely along the Shore, Looking Closely in the Rainforest and a few more. 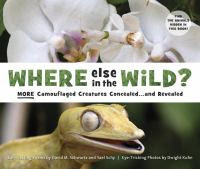 Following the success of Where In The Wild?, Where Else In The Wild? presents more animals that we might miss completely even if they are right under our noses. A poem about the animal clues us in on the camouflaged creature featured on that page. But, even with that help, it is quite challenging to spot some of these animals that blend so well with their surroundings that it is awe-inspiring. Of course, after the first few reads, it is easy to spot the brilliantly blended creatures. But, that does not take away the amazing adaptations that evolution has honed in these animals. And, not being familiar with some of them (especially Scorpionfish and Ambush Bug) made it tougher for me to spot them even with the poem, and I had to open the flap to find out. 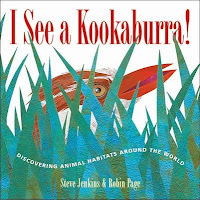 This is another great book that urges the children (and adults) to keep their eyes open and look closely at their surroundings teeming with life concealed. 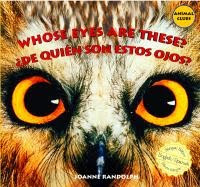 Much like the Looking Closely series mentioned above, these photo books present a zoomed-in picture of the eyes of an animal with a question that describes the pair of eyes: Whose orange eyes are these that help it hunt? [the eyes shown on the cover]. We turn the page to find out that the Owl's orange eyes help it hunt. And, even though the cover image shown here seems a little disconcerting, this is quite a toddler-friendly book with bare and precise pictures and text introducing some interesting animals. Whose nose/ears/toes/tongue are these? are all part of this series. I particularly enjoyed Whose tongue is this? as it showed us that tongues are not always pink , but can be black and blue. Honk Hee-honk Honk! hisses the gander as he chases away intruders and other suitors when he finds his mate. 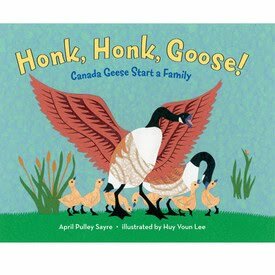 Thus starts this informational book that tells the story of how a gander and goose mate and finally start a family. The dangers along the way, the diligence and dedication with which Father goose guards his mate as she lays one egg each day, their minor setback of losing one egg to a raccoon, culminating in the the hatching of their six babies, all make for a very interesting read-aloud session. Especially the Honk! Honk-hee-honk! Honk! sound effects repeated often to point out the various situations in which the gander employs it to his advantage. The cut-paper collage work is beautiful and it complements the text well. The last page zooming in on the gander's hiss is both menacing and endearing. At the end, the book offers some notes on the mating habits, history, and science behind their behavior, charging the young minds to start observing the next time they are in the vicinity of these plucky birds which were on the endangered list about a century ago and have made quite a comeback. 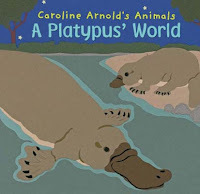 Caroline Arnold's Animals are a series of books by the author that provide a nice bridge between visually-powerful picture books and text-heavy fact books. A Moose's World, A Walrus' World, A Wombat's World and many more in this series have a distinctive style and presentation that focuses on the life-cycle of the creatures - from birth to when they are ready to be independent and care for themselves and finally procreate to complete the circle. The facts are wrapped in a simple story where the protagonist is a baby animal with whom we instantly form a bond. The simple artwork by Ms. Arnold captures the physical uniqueness of the creature and becomes the focus as we read the small box of facts on each page. At the back, there is a map of where these animals can be found around the world, as well as some additional facts that might fascinate older readers. Clutched to their breasts (Bats), tucked in their pouches (Kangaroo), braced beneath their wings (African Jacana), gripped in their teeth (coyote)... we learn about the care with which many of the animal parents carry their babies. The book ends with the sweet and comforting image of a mom hugging her child, with the words Safe and snug, the way your mother carried you. Notes at the back presents thumbnail images of the animals along with some facts about them. 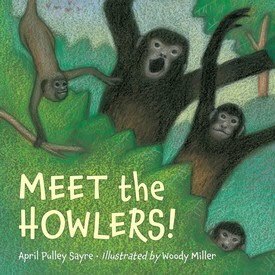 We get introduced to Mama, Papa, Sister, Brother and Baby on the first page, setting the stage for learning more about Howler monkeys as we read the book. 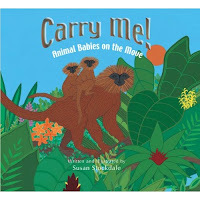 The whimsical yet lyrical text showcases the behavior of the howler monkeys by simply stating what they do: Baby hitches ride on Mama's fur, No one says he is lazy or too big for her. The illustrations using acrylic, water color, crayons, and color pencils present a lush and animated picture of their lives. The bright colors in the full-page sketches balance playfulness and authenticity, neither wrapping them in saccharine cuteness, nor making them eerie and distant. A few sentences of facts on each page expand on the verse, providing just enough information to keep the young ones engaged. The Woo-hoo-hoo!/AH-UH-OH! refrain repeated periodically throughout the text reiterates the origin of their name, and makes reading aloud fun. Back of the book provides a map of their range and some additional facts. While the title might suggest similarity to Meet the Howlers mentioned above, Meet the Merkat is by an entirely different team, with quite a different presentation. Author Darrin Lunde is a mammalogist for the American Museum of Natural History. 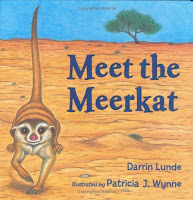 His two books Bumblebee Bat and Meet the Meerkat presents facts about the respective animals in a friendly Question-Answer style: Hello little animal, what is your name? we ask, and he answers, My name is Little Meerkat. I am a kind of mongoose. As we pose questions like what does he eat, does he live alone, what does he do all day, does he make any sound, we learn a lot about the life of these animals in a few short crisp sentences. The watercolor, ink, and colored-pencil illustrations by award-winning scientific illustrator Patricia J. Wynne not only capture the activities of these animals but presents the landscape in its stark and barren state which impresses upon us the struggle of these animals to forage and keep themselves fed. This became a favorite bedtime read, especially as the last one of the pile for the night, because the last page shows the meerkat family curled up in their den under a cloudless dark night sky as we say Goodnight! Philippa-Alys Browne 's eye-catching style held our attention as we read A gaggle of geese : the collective names of the animal kingdom and African Animals ABC (Barefoot). 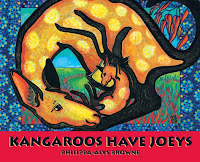 Kangaroos Have Joeys introduces us to the names of twenty-four baby animals through simple rhyming verses, accompanied by gorgeous and bright illustrations with distinctive pattern. "Cods have codlings / Penguins have chicks / Moose have calves / Rabbits have kits." Some familiar ones like horses and ducks as well as off-beat ones like codfish and moles are presented. I learned a new fact or two from this book. Notes at the back of the book provides additional information about these animals. 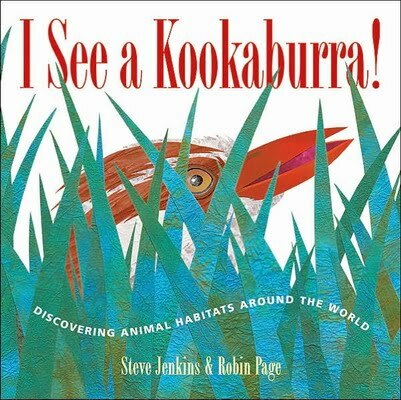 wonderful compilation and we just looked up cookaburra yesterday on the net! Wow. I want many of these books for myself. Loved this post Sheela. Nowadays most of our children’s are highly interested about zoology and wild life nature… And Animal book for children is a good fundamental source of knowledge when it come to a wild life theory and most of all it is very interesting to read and surely you child’s will like it..
We have thoroughly enjoyed some of the books listed ! adorably compiled, Sheela. Well, you know the story...we've enjoyed the Meet the Meerkat so much that it actually inspired the four yr old's halloween costume. Also, the her pre-school classroom is called Meerkats. She loves the fact they are like the mongoose and often brings it up. :) I've told her the story that back in the 80s and early 90s, how they were quite a common visitor at my parents' neighborhood back in Chennai (and his enemy the big C too!). I am pretty sure that overcrowding with construction of flats must have affected both their populations around there, very sadly. Well there were foxes in Adayar...if you can believe that! Thanks to the IIT campus we still have tad bit wildlife left in the city. Well, sorry to ramble...I am sure she will love them all. Thanks! wow. great list. Will be coming back to this every now and then. Nice compilation Sheels! Have come across some of them, will look out for the rest. Came across some non-fiction Dr.Seuss books ('If I Ran the Rainforest' and three more) recently. I think Meera had mentioned them once? Wasn’t terribly impressed but the Seuss-mad 5 year old lapped them up. If you come across them, do check them out. What a charming collection Sheels! Will get back to you with feedback. We have found most of them here. very well compiled list Sheela. Wonderful collection Sheela and well put together! For a short break from stories, cars and farm animals, we recently picked up "Tiger" by Sherry Been. Its great for the 6yr old and I simplify it when I read it to my 2 yr old. Will be coming back to the list now and then, thanks S! Such a good list to refer to Sheela.